Karen is your typical bright candy apple red creme. I've seen other blogs call it poppy red, and I can see that. It was a bit sheer, so I had to use thicker coats for full coverage. I had no issues with it staining the nails, but be careful getting it on the cuticles because it can be hard to remove there. If I'm honest, I'd pick Marigold over Karen just because of that shimmer! Marigold has more orange undertones than Karen and has gold shimmer/flakes. That bright base and gold shimmer makes this one hop right up into my top recommendations for the collection. I used 3 thinner coats for full opacity (you may see slight VNL in my photos, but you cannot see it in real life). I'm not sure why I don't think of Minnie when I see this polish. Of course, I immediately thought of Minnie Mouse with the red dress, but with a little help from Google, I found out that she has pink outfits as well. That said, Minnie the polish is a coral creme with more pink undertones. I love coral polishes, especially during the summer, so this one also tops my list for the collection. And lastly we have Missy which is a light cool-toned pink creme. I used 2 coats for the photos above, and I had no formula issues with any of the polishes shown tonight. I'll be back soon with the next set of polishes from the Sunshine Collection. 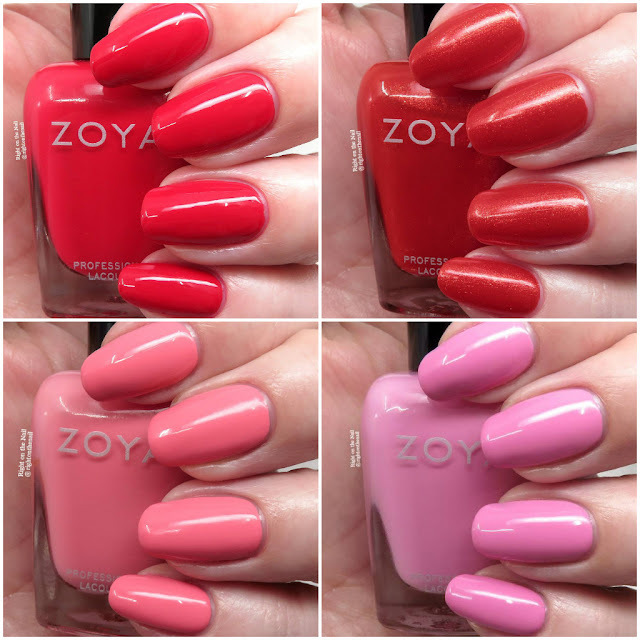 Zoya just released a trio of jelly polishes called the Jelly Brites that I'll be showing in the next couple weeks as well. Zoya polishes retail for $10 and you can find out more about them on their website, Facebook, Twitter, or Instagram pages. Keep an eye out for them in your local Ulta store if you want to see the bottles in person before you buy.